November 7, 2014 – Montreal, Canada – Aimtec announces the release of the AME series AC-DC converters. 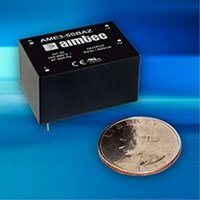 The new regulated 1 watt AME1-AZ, 2 watt AME2-AZ, and 3 watt AME3-AZ series are packaged in a miniature length width and height of only 1.33 x 0.87 x 0.71 inches (33.70 x 22.20 x 18.00 mm). The converters have EMI (EN55022, class B) filtering built-in eliminating the need for external components. Features include: Input / Output Isolation of 3000 VAC, Over Load Protection, Over Voltage Protection, Short Circuit Protection, Soft Start, Energy Star Compliant (No-load power consumption less than 0.3 watt). Safety approvals include cULus, CB and CE. These new AC-DC power converters will expedite and simplify industrial and commercial product design in a highly affordable solution while offering the smallest possible footprint. The standard package is available with 3.3, 5, 12, 15 and 24 VDC output ranges, with a universal input of 90 to 305VAC (optional 90-528 VAC), 47 to 440Hz, or 130 to 430 VDC. Operational temperature range of all models is -40ºC to 80ºC. Aimtec is headquartered in Montreal, Canada with offices in Europe and Asia. Aimtec is involved in the research and development of modular switching power supplies. Its product portfolio includes modular AC-DC and DC-DC switching power converters and LED drivers.